Elizabethtown Borough is seeking community input on its project to construct 85 parking spaces near the Elizabethtown Train Station and move an abandoned freight station on that property to a new location. If you would like to submit an official response to the borough's Determination of Effects Report, please email them to boro@etownonline.com by May 9. The input will be submitted to to the Federal Transit Administration. Following is a summary of the project. The Borough recognizes the need for additional parking at the Amtrak station, and it has acquired two properties at the end of Wilson Avenue for the construction of an overflow and long term parking lot specifically for the Amtrak station. Residents and train riders may recall that Elizabethtown Borough awarded a contract for the parking lot construction last year. However, as the freight station building was deemed to have historical value, federal regulations required additional review regarding its status. The Borough withdrew the construction contract in deference to this review. for demolition, but the current proposal relocates it to the rear of the White Oak Mills site on West High Street, a short distance away on the same rail siding where the building currently sits. In this new location the building would be preserved and utilized by an active historic mill. Discussions between the Borough of Elizabethtown and White Oak Mills for this project remain preliminary until approval is granted by the appropriate regulating agencies. However, the potential agreement would transfer ownership of the former freight station building to White Oak Mills. White Oak Mills is willing to abide by a covenant outlining preservation and maintenance of the historic building. Under a related project, funded by a state grant awarded to Elizabethtown, the Borough has also been working with White Oak Mills to acquire an easement of 15 feet along the edge of an unimproved parking lot on West High Street to install stormwater facilities and a section of pedestrian and bicycle pathway connecting the Amtrak Train Station with downtown Elizabethtown. White Oak Mills would acquire a portion of an adjacent and unimproved property owned by the Borough as part of this project. These economic development improvements are demonstrated on the Master Plan for Downtown Elizabethtown and are consistent with the Regional Comprehensive Plan adopted in 2011 by the Borough and the three neighboring municipalities. As a consulting party for historical resources, the Elizabethtown Historical Society has proposed alternatives to the Borough’s plans which are outlined in the Determination of Effects Report. 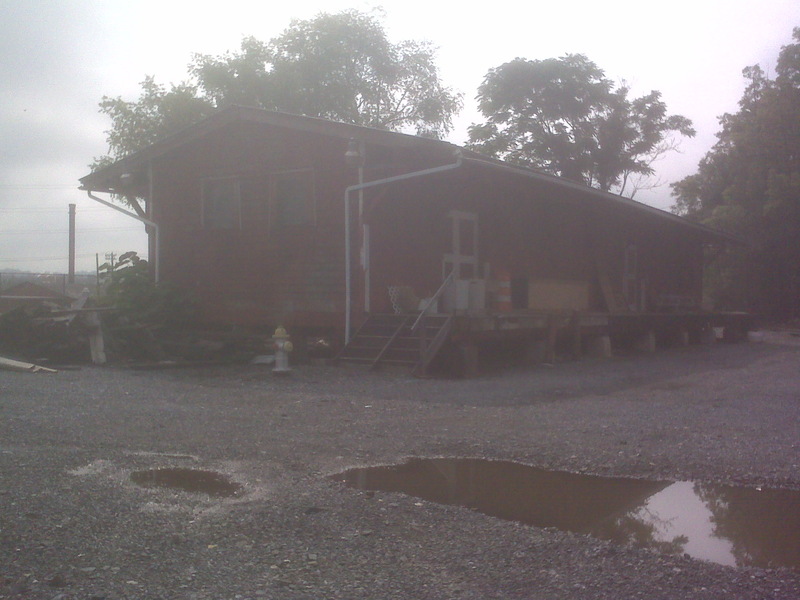 The Historical Society is requesting that the former freight station building be maintained in its current location or relocated to a Borough-owned lot and be made available for public use as a train artifact museum. The Borough is sensitive to the request to preserve the building and believes that the proposal for relocation to the White Oak Mills property exceeds expectations. This move will not only preserve the building but will allow it to be utilized and maintained in a function respectful of its history. The Borough does not embrace the Historical Society’s proposal to maintain the building in its current location, as it would negatively impact the proposed parking lot facility. In addition, should the Borough be required to retain ownership of the building, excessive financial resources would be necessary to preserve and maintain the building and additional liability would be incurred by adding a building to its public facilities. As a compromise, the Borough has offered an opportunity for the Historical Society to display train artifacts in the Amtrak Train Station. This arrangement could provide additional revenue for maintenance of the train station and may create the potential for extended public hours at the station. Thanks for your comments. Realistically, I don't think leaving the freight station with our parking lot is the best answer. Any use it would have -- from a business to a museum -- would require parking. And the train station parking would interfere with the station. I am sorry that I missed the deadline for comments to the FTA. I wish the Advocate had run a story on this. I just want the Borough to know that I am 100% in favor of your proposal to move and sell the freight building to White Oak Mills. I have been commuting to Harrisburg on the train for 15 years now. I ride my bike to the train station most days from home as part of my commute to Harrisburg. The new station is fantastic. The parking lot, train station building, and landscaping were done very well and are all appreciated. Your future plans for extra parking and a pedestrian walkway are very much desired by myself and others that I talk to. Not having pedestrians or bikers using High Street would be a brilliant safety improvement. If the Borough needs, I could have over 50 commuters sign a petition supporting the Borough's position. There are over 60 commuters to Harrisburg on the 6:52 am train, another 20 on the 7:50 and around 8 on the 8:40 am trains each day, and those are just the trains going to Harrisburg. Thank you very much for persevering on this project. I love that the former freight station can be used and preserved as a storage facility, its original intent. Thanks for your comments. The borough has been working for many years to implement its plan for the downtown, and the train station and the other projects you mention are all key components. If you feel it's important to circulate a petition, by all means please do that. Since we're past the deadline for official comments, it won't be part of the record, but I can't see that it would hurt. Logically this is not good! No matter in what angel of the story you try to analyze..